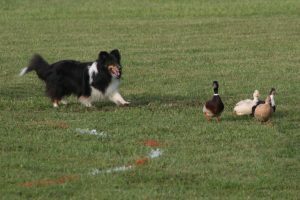 Blitz, my Icelandic Sheepdog, finished his HRD I title this weekend. 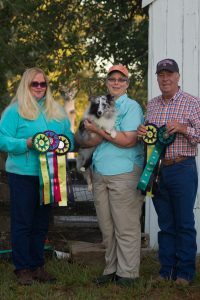 He is now GCH Caradoc Happy Anniversary PT, HRDs I ! The National would not be easy for me this year I would be 2 months into my chemo treatments, starting to feel more fatigued. I not only had Valor I was bringing, but a 7 month old who through no fault of hers, was missing some lessons in life to date. Thanks to 2 wonderful friends who not only shared the driving, my crate moving and dog moving, Jenny Rizzo and Kris Zielinski, both first time Belgian Malinois owners, still can’t believe I talked them into coming and sharing the experience because I knew we did not want to miss The Belgian Nation Celebration!! – how exciting it would be. I could see how much everyone on the Committee had work so hard to make this the Best it could be – and it was! Purina’s awesome new building was beyond spectacular along with their staff. 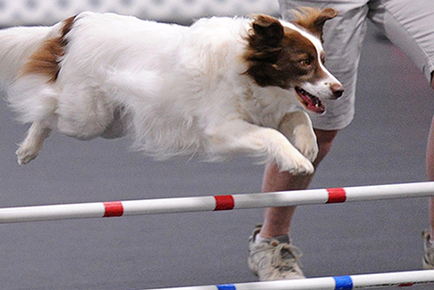 One minute with a two ring agility trial going on and before you know it ready for obedience and breed. Valor in BOB, not in the best of coat, but going through his paces under the expert handling of his breeder Kate Eldredge. Poetry in motion…that boy can move!! My goal for Valor in 2017 was to earn his UD and become my 3rd CH-UDT. Although it seemed very bleak the last day Valor was entered for the year to earn that 3rd leg, but he did. 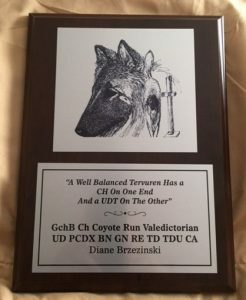 Therefore allowing – the very best thing for me to happen at the National which was attending the Annual Awards Banquet and receiving in person Valor’s Well Balanced Tervuren – CH-UDT plaque!! Update: First trial of 2018, Louie and I had our first perfect weekend ever! 4 runs, 4 Q’s at the WRKC Trial at CABTC!! 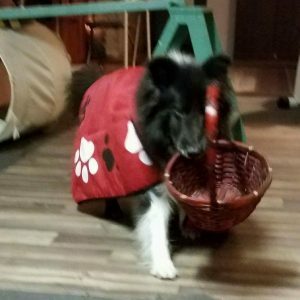 Clipz completed his trick performer title by doing a skit about going to visit grandma as little red riding hood. He had to carry a basket, then climb a ladder, cross a dog walk bridge, go thru a tunnel, weave thru the trees, skateboard down the hill, oops he fell and had to do a roll over. Finally gets to grandmas knocks on her door, barks to alert her, and gives her big kisses.